Beautiful vibrant colours with a modern flair.You can almost hear the excitement andnotes jumping out of this bouquet ! 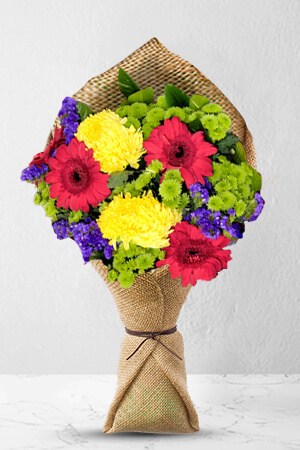 Thisbouquet is perfect to send on any occasion!Add a vase to this bouquet to make it evenmore stunning.Vase not included however to betterpersonalise your gift, we recommend addinga Standard Vase to accompany this lovelycombination. As l live in the UK, l have not heard from the recipient yet as to how nice the flowers were. I have ordered from you before and apparently the flowers were lovely. Recipients of the flowers were very happy and we have found the service excellent. Fast easy ordering, feedback straight away to confirm order and beautiful flowers delivered same day just as promised. Very happy with the service ...would definitely use again.